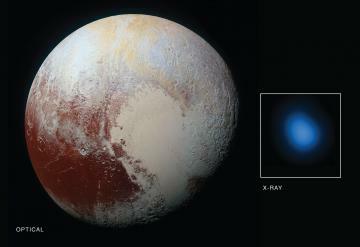 New Horizons scientists using NASA's Chandra X-ray Observatory have made the first detections of X-rays from Pluto. These observations offer new insight into the space environment surrounding the largest and best-known object in the solar system's outermost regions. While the New Horizons spacecraft was speeding toward and beyond Pluto, Chandra was aimed several times on the dwarf planet and its moons, gathering data on Pluto that the missions could compare after the flyby. Each time Chandra pointed at Pluto – four times in all, from February 2014 through August 2015 – it detected low-energy X-rays from the small planet. Pluto is the largest object in the Kuiper Belt, a ring or belt containing a vast population of small bodies orbiting the Sun beyond Neptune. The Kuiper Belt extends from the orbit of Neptune, at 30 times the distance of Earth from the Sun, to about 50 times the Earth-Sun distance. Pluto's orbit ranges over the same span as the overall Kuiper Belt. The team recently published its findings online in the journal Icarus. The report details what Lisse says was a somewhat surprising detection given that Pluto – being cold, rocky and without a magnetic field – has no natural mechanism for emitting X-rays. But Lisse, having also led the team that made the first X-ray detections from a comet two decades ago, knew the interaction between the gases surrounding such planetary bodies and the solar wind – the constant streams of charged particles from the sun that speed throughout the solar system — can create X-rays. The Johns Hopkins University Applied Physics Laboratory designed, built, and operates the New Horizons spacecraft and manages the mission for NASA's Science Mission Directorate. NASA's Marshall Space Flight Center in Huntsville, Alabama, manages the Chandra program for NASA's Science Mission Directorate. The Smithsonian Astrophysical Observatory in Cambridge, Massachusetts, controls Chandra's science and flight operations.